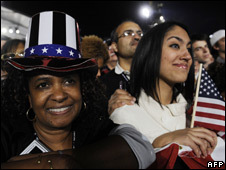 The BBC's Kevin Connolly reflects on how Barack Obama's historic election win has helped widen the boundaries of the American dream. There is no shortage of things which set this vast, eternally surprising country apart - strawberry-flavoured cream cheese, valet parking and a lack of respect for the usefulness of the kettle are three that spring to mind. But the greatest difference of all is surely the fact that the founding idea of the state is to guarantee the right to the pursuit of happiness. That is a brilliant piece of phrase-making, because it hints that the dour, crotchety old revolutionaries who wrote the Bill of Rights knew in their hearts that happiness is as elusive as a moose in hunting season. You are not guaranteed to go to your eternal reward with a smile on your face, but you are encouraged, even inspired, to try. So this is a place of dreamers and the idea of that great pursuit lies at the heart of the American dream. It is an idea that drew plenty of members of my own family here in the past - even though most of them went straight from the boat to a hole in the road with a shovel in their hands. They came, in part, because the present in America was better than the past they left behind, but mainly because they were inspired to believe that the future could be better still. The whole idea of the American dream after all is unique - no-one talks about the Irish or German dream, and if there is a British dream then no-one has told me about it yet and I am running out of time. 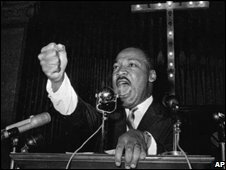 The problem was, of course, that throughout most of American history the rights to that dream and the possibilities of that pursuit were essentially confined to white people. Nobody ever quite said "all men, except slaves, were created equal" but that is the way it was. This country was always a curious coalition between immigrants who came in hope, and immigrants who came in chains. I knew all this of course, in the way you do know the things you read - but Campaign 2008 brought the issue to life in a rather startling and rather humbling way. It made it easier to ask black Americans about the past and easier for them to tell. At an Obama rally in a southern state a few months back, with thousands of people packed into a high school gymnasium, I met an African-American man who did his best to bring the cold facts of history to life. 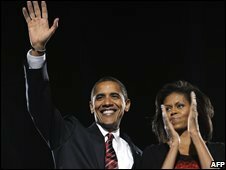 It was at a difficult moment during the primary season for Obama, when it was still far from certain that he would win the Democratic nomination, let alone the presidency. The man had tears in his eyes when he talked about the possibility of Obama winning the White House but he was convinced that it would not - could not - happen. He told me when he was very young he was mystified that, although they lived right beside the seaside, their occasional visits to the beach involved long bus journeys past miles of perfectly serviceable sand and sea. Even days out in the sunshine were segregated. His family was confined to a rock-strewn beach for blacks. When he was a little older, in 1960, he went down to the local polling station with his granddad, because the old man wanted him to remember the day he voted for Jack Kennedy. Except he did not, because a posse of local white men was waiting at the local polling station to make sure he did not dare to go in. And, of course, he remembered the lunch counters he was not allowed to eat at, the hotels he could only enter through the servant's doors and the simple lack of respect and equality in every eye contact with white folks. He put it all with an eloquence that I cannot match, but he was not bitter and he accepted that America is changing and that young people do not have the racial attitudes of previous generations. He just did not think it was changing fast enough for him to see a black president before he died. Oddly enough, that was the night I started to think he might be wrong. The wait for Obama was as long as always, the security both overbearing and chaotic and the local high school band played a version of Signed, Sealed, Delivered that Stevie Wonder would not have recognised. But when he spoke, Obama was brilliant - his ability to conjure a phrase, capture a crowd and articulate a vision touched with magic. I thought of that night again this week, when Obama spoke not to a high school gymnasium but to a crowd of a quarter of a million and to the wider world beyond them. He is a complex figure, a child of a white mother and a black father who in his very essence draws together two of the longest threads in America's national tapestry and has used his own life story to persuade Americans that hope is audacious rather than foolish. We have no idea yet if he will be a good president when he sets about the task of shaping history rather than making it. One of his most important jobs now is to protect the constitution but the truth is that merely by winning the White House he has expanded the scope of its happy promise and set the boundaries of that dream a little wider. From Our Own Correspondent was broadcast on Saturday, 8 November, 2008 at 1130 GMT on BBC Radio 4. Please check the programme schedules for World Service transmission times.